The Jovell, a condominium development by Tripartite Developers Pte Ltd located along Flora Drive, will open its showflat for preview this Saturday (15 Sep). The Jovell is located in a quiet and scenic private enclave in District 17. The new property launch sits on a staggering 330,225 sqft piece of land, which is on a 99-year leasehold, and is expected to accommodate 9 blocks towering 8 storeys up. According to the developer, The Jovell condo will feature a total of 428 luxurious units with a mix of 1 to 4 bedroom unit configuration. That means the condo is a great choice for people who are single, married and/or those with huge families. The island resort-themed condo will feature a continuous 200-metre long waterscape with a rope island and pool island that incorporate a rope bridge, Jacuzzis, lounge pavilions and sun decks. “The picturesque location and our competitive pricing have afforded us a series of successful developments in this area that have proved popular with HDB upgraders and Gen Y home buyers. 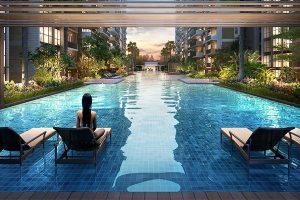 Similar to our previous projects, we believe that same factors will remain appealing to all homeowners,” said Betsy Chng, head of sales and marketing at Hong Leong Holdings. Flora Drive, where The Jovell is located, sits in an up market place that offers convenient access to a variety of shopping, schooling and recreational amenities. But the green surrounding and the tranquility that comes with it is what makes the area even more attractive. So if you’ve been looking for a location in Singapore that befits your status and classy taste, then The Jovell in Flora Drive might just be an ideal choice for you. The Jovell is a resort-themed development that has all amenities that can make life both comfortable and fun-filled. Some of the main facilities available within the condo include a 300-meter swimming pool, fully-equipped indoor gym, clubhouse, children’s playground, function room, BBQ pits and grand function room. One of the things that make The Jovell desirable is its strategic location in Pasir Ris, which is well-connected to major transportation access points. This includes the East Coast Parkway (ECP), the Pan Island Expressway (PIE) and the Tampines Expressway (TPE). The condo is also a few minutes away from the Upper Changing MRT Station, something that makes travelling to other parts of the island even more convenient. That means residents can commute to work and/or move all around Singapore quite seamlessly. There are a number of prestigious schools-both local and international-that are located near the Jovel residence. Most of the schools are found within a radius of 3 kilometers, making access to education for the residents even easier. A range of upscale shopping malls abound in the areas surrounding the residence. This makes shopping for merchandise, foodstuff and other staff quite convenient. The fun at The Jovel doesn’t just stop at the luxury facilities within the condo. There are actually plenty of recreational amenities available nearby that residents can go for fun outings. Information about The Jovell unit pricing is not yet clear but market analysts predict the price to range between S$1000 and S$1200. This price estimation was arrived at after careful consideration of the condo’s location, the value of the land and the average unit sizes. Bookings for The Jovell will start on 29 September when the project is officially launched. The development is expected to be completed in 2023. The Jovell is the second condo to be launched for preview over the weekend – the other being Mayfair Gardens. Located in 2 Riffle Range Road, District 21, the site (formerly known as Mayfair Gardens) was acquired at a whopping $311 million plus an additional $52 million as lease top-up premium for a fresh 99 years. The developer of Mayfair Gardens, Oxley Holdings, said the project consists of four five-storey residential blocks of one- to four-bedroom units sized from 506 sq ft to 1,216 sq ft. Indicative prices range from about $938,000 for a one-bedder to $2.3 million for a four-bedder. The development will be inspired by the buildings in London’s posh Mayfair district. iCompareLoan mortgage has been a trusted mortgage broker in the market with almost 100 percent successful rate on all home loan seekers. So you can trust us to help you get that housing loan fast enough for you to grab a unit or two at the The Jovell condo. As iCompareLoan mortgage broker, we’ll help you compare home loan Singapore, determine favorable interest rates and choose a home loan package that befits your home purchase needs. We will also link you directly to the top lenders in Singapore so you can get your loan processed and approved as quickly as possible. Our brokerage services are absolutely free of charge; hence you don’t have to worry about spending even a penny. For advice on a personal loan.